It’s no secret that Casio G-Shock watches are popular with service members. For less than $100 it’s the best military watch that can withstand the most demanding use and the harshest environments. While any G-Shock model can handle the rigors of military life, we’ve chosen the following watches for their conservative styling, low price, features, and battery life. Standard G-Shock Features: All the following watches have the standard G-Shock features: shock resistance, water resistance up to 200 meters, 12 or 24 hour format, and an electro-luminescent (EL) backlight or LED light. Unless otherwise noted, they also feature world time, auto calendar, 4 daily alarms including 1 snooze alarm, stopwatch, countdown timer, and button tone on/off setting. All selections have a a resin band for easy adjustment and maximum comfort. Tough Solar: One major decision to make when buying a G-Shock is whether to buy a watch that has the Tough Solar feature. With a Tough Solar watch, the battery can last up to 9-10 months after a full charge with no further exposure to light, and the battery will continue to recharge whenever exposed to light. The rechargeable battery is expected to last for many years (often beyond 10) and will generally outlast a normal battery. A Tough Solar watch is a good choice if you expect to be somewhere remote for a while and don’t want to be concerned with having to replace the battery at an inopportune time. We usually prefer Tough Solar watches, but also keep in mind that the regular batteries tend to last a lot longer than their estimated life (at least for all-digital models). Also worth noting for non-solar watches is that all-digital models have a longer estimated battery life than analog models. Note: Prices may have fluctuated from the time of publication and some watches may be over $100. Also some models might be priced higher than $100 on international Amazon sites. 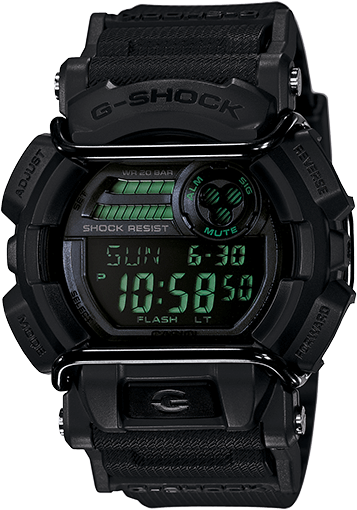 The GA-700 series is a recent addition to the G-Shock lineup. This extra-large 53.4mm watch is ideal for those with bigger wrists. 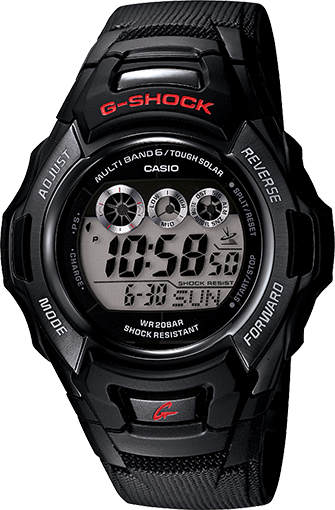 The GA700 is notable for its front-facing LED light button (a first for an affordable analog-digital G-Shock) and its estimated 5-year battery life which is longer than most non-solar analog-digital models. Other features include world time, 5 daily alarms with 1 snooze alarm, stopwatch, and countdown timer. 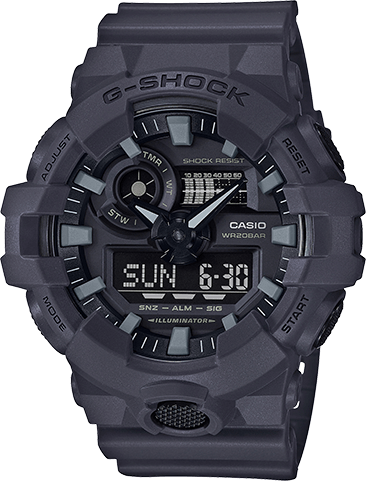 The dark gray GA700UC-8A from the GA-700UC Utility Color Series is one of three models with military-inspired colors. 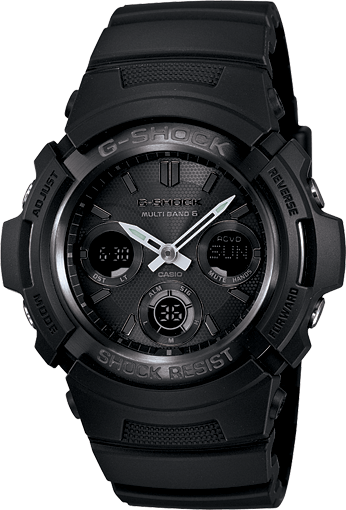 The GD400MB-1 is a large-size G-Shock featuring a “bull bar” wire face protector for increased impact resistance. This gives the watch a tough tactical look combined with its green-tinted reverse LCD display and all-black body. This watch features an adjustable “flash alert” with LED light and buzzer for the alarms, hourly time signal, and countdown timer. Other unique features are the multi-time function that will display the time for 4 different cities and a low battery warning. The G100-1BV adheres to the military’s K.I.S.S. (Keep It Simple, Stupid) principle for those who prefer a no-nonsense watch with analog hands. The time or date is also shown on a small digital display and the watch features magnetic resistance, 1 daily alarm, stopwatch, and auto calender. The battery is rated for 3 years. The GWM530A-1 is one of the sleeker looking G-Shocks with a relatively low profile and has Multi-Band 6 capability for automatic time syncing by receiving radio signals from transmitting stations in the US, UK, Germany, Japan (2), and China. 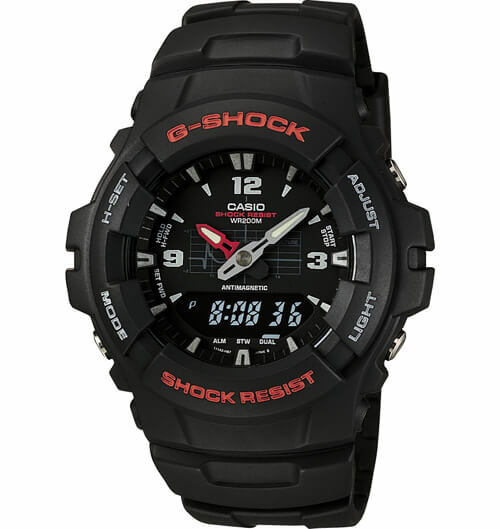 A distinct advantage of this watch is that the digits on the LCD display are very large compared to other G-Shocks. The AWGM100B-1A is a good upgrade from the G100-1BV if you want a solar-powered analog-digital G-Shock. This Tough Solar/Multi-Band 6 model features a simple all-black design with white analog hands for easy viewing. 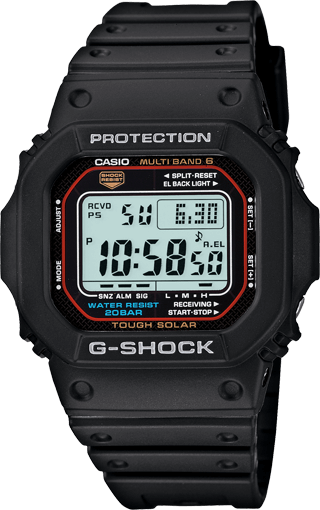 It is the only solar-powered analog model on this list and like the G100-1BV it is a smaller-sized analog G-Shock than the GA-100 models. For basic time-telling and worry-free operation this would be a solid choice, but if you plan to use functions like stopwatch and countdown timer often you may want to opt for an all-digital model. The simple and confident looking GW6900-1 has an easily accessible EL backlight button on the front of the case which makes it a good choice for those operating in the dark or underwater. The DW6900-1V is a more affordable option with the same case but it lacks Tough Solar, Multi-Band 6, and world time. 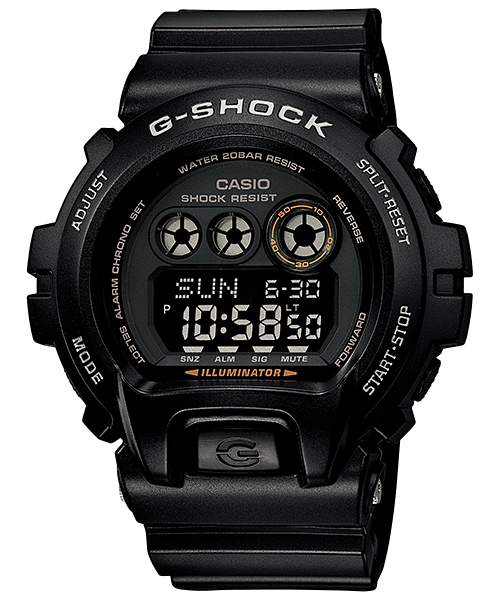 The GW6900 descends from the DW6600 which was the first G-Shock with an EL backlight and was issued to Navy SEALS. 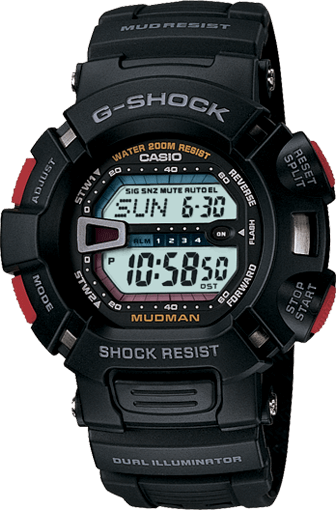 The G9000-1V Mudman is the previous generation Mudman and is known for its extra-protective case featuring mud and dust resistance. It’s a good choice if your military deployment takes you to an extreme environment like the desert or jungle. While there are other G9000 Mudman watches with military-themed colors, those models have a reverse LCD display and we recommend this model for its easier-to-read standard standard LCD display. Battery life is rated for 3 years. The GD120MB-1 is a blacked-out all-digital Military Black version of the popular Big Case 100 Series. Measuring 55 × 51.2 × 17.4mm, the GD120 is better suited to those with large wrists. The GD120 has a 7-year battery making it a good choice for worry-free military use. 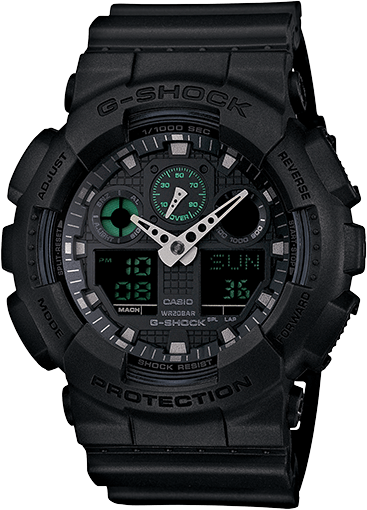 The GA100MB-1A is a stealthy matte black analog-digital model. 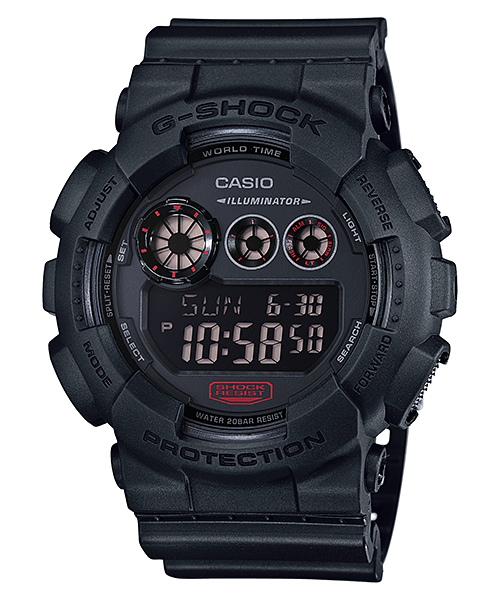 It is a big-case model with stealth lettering that is part of the Military Black series like the GD120MB-1 above. The GA100MB-1A has high contrast analog hands for quick and easy reading, but this comes at a cost of less battery life than all-digital models. The GA100MB-1A features magnetic resistance, a 1/1000 stopwatch, and a speed measurement function that will calculate your speed measured over a certain distance. It also has LCD subdisplays to display the time and date and its digital functions. This model is a favorite for police and law enforcement use. The GDX6900-1 is the extra-large version of the popular 6900 case. It is known as the MIL-STANDARD G-Shock because this model has passed the environmental stress testing of MIL-STD-810. It is also known for its impressive 10-year battery life and Alpha Gel protection for extreme shock resistance. It is a popular model that is available in a wide range of colors and styles, but for military use we are sticking to the basic black model. There are also camo versions with standard LCD displays that are worth looking into. 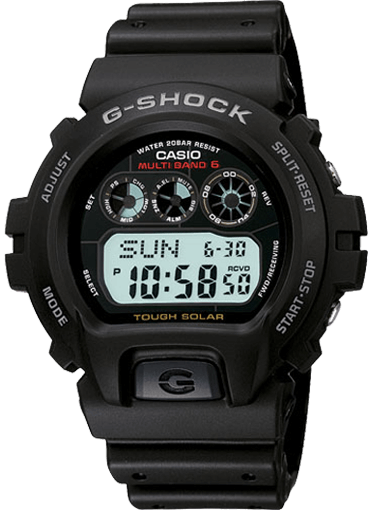 The classic GWM5610-1 is based on the first G-Shock model ever made and has modern features added like Tough Solar power, Multi-Band 6 timekeeping, and world time. At 12.7mm thick it is the thinnest G-Shock model here which makes it a good choice if you need to wear the watch under long sleeve shirts and uniforms. The GWM5610-1 is a good all-around watch for any military application and its clean and timeless design will look good anywhere. The gray GD350-8 looks like army equipment and its special features are designed for stealth operations. Unlike most other watches, the countdown timer can be displayed and activated with the current time showing simultaneously. The countdown timer has a dedicated button that is large and easily accessible in any condition. For end of countdown alerts, the watch can either be set to vibrate or beep and flash a LED light. This unique vibration alert can also be used for alarms and an hourly time signal. The high luminescence LED can be set up for 1, 3, or 5 seconds. The watch also features 5 daily alarms including 1 snooze alarm and a long-lasting 5 year battery with a low battery warning. All these useful features add up to make this our top pick for a military G-Shock. About Military Dress Codes: While certain units may have their own dress codes, there aren’t any strict regulations on wearing watches in the military other than to keep it simple and conservative. Regarding jewelry in Army Regulation 670–1, the U.S. Army states “Soldiers may wear a wristwatch … with Army uniforms, unless prohibited by the commander for safety or health reasons,” and goes on to say “Any jewelry or monitors worn by Soldiers while in uniform or in civilian clothes on duty must be conservative.” 2201 of the U.S. Navy’s Uniform Regulations states “Wristwatch / Bracelets. While in uniform, only one of each may be worn.” In AFI 36-2903, the U.S. Air Force is more specific on what constitutes a conservative watch and says, “Conservative examples (not all inclusive) are solid color black, brown, silver or gold. Prohibited examples are diamond-covered, neon, bright colors, and bands that exceed 1-inch width..” The U.S. Marines Corps Uniform Regulations state “Inconspicuous watches are authorized for wear in uniform.” Based on these regulations we can be safe to assume that any dark, solid-color G-Shock watch is acceptable for military use in any branch. Conclusion: Keep in mind that any G-Shock model can handle military use so you should not limit your choices to this list only. 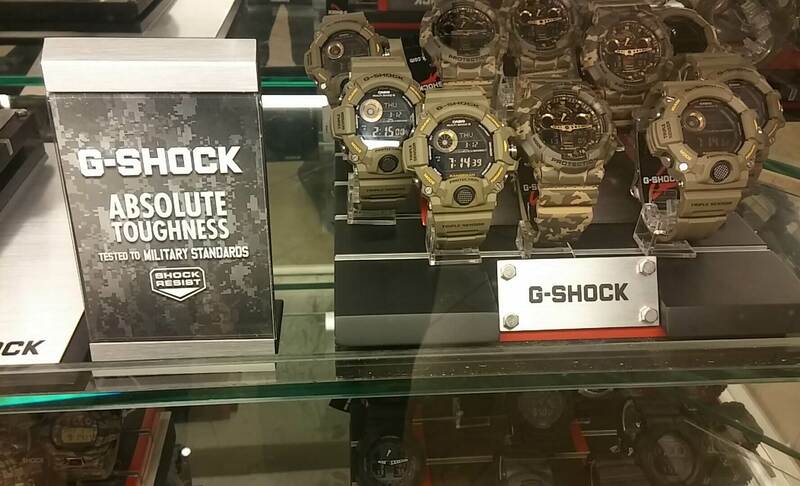 Also see our Top Camouflage G-Shock Watches. For higher-end specialty G-Shocks with more features like compass sensor, altimeter, and barometer see our Master of G Buyer’s Guide. For our overall top G-Shock picks see our 10 Best G-Shock Watches. For the cheapest options see Cheap G-Shock Watches Around $50. the GD120MB (i have the camo version: GD120cm) is one great watch. the camo version comes with the standard display. love it. i have small wrists (like girly sized lol) and this watch fits just fine, and doesnt look too big for my small arms. I have 35 gshock watches and 6 PROTREK watches. I have 5 over the ones you have on your Website. I have the g100-1a , the gw6900-1 the mudman. The ga700-1b .I love that watch for the price. I have 2 Rangeman gshock watches and the GWF 1000-1 Frogman. And the King GXW56-1BJF gshock and the gwm5610-1 gshock and way to many more to mention. I have been wearing gshocks for 34 year’s. I am glad I found your Website. You give great information on your website. I love all gshocks Big or small. Thanks for keeping the buyer informed. Your site is very good for sharing g shock watches information. I have recently been introduced to g shocks. And thrilled for all functionalities they have. I have purchased “rangeman “and “gulfmaster gn 1000b” and iam enjoying. I want to collect one more .pl. advise me between ” ga 100 and ga 700 . Which one to select in terms of features and battery life. And one more clarification , is there any other watch model in the world that can be compared with g shock watches in terms of features and functionalities ? Thank you. GA-100 and GA-700 are similar with a few differences. GA-700 is a larger size and has longer battery life (5 years versus 2 years). GA-700 countdown timer is 60 minutes maximum and GA-100 is 24 hours. Glad you show the GW6900-1, a descendant of the DW6600. For me the biggest advantage of the GW6900-1 vs DW6900-1V is the “solar” rechargeable battery. It’s why I abandoned quartz watches in the very early 1980’s during my military career, using Hamilton MIL-W-46374B and GG-W-113 watches, alternating periodically between them. I could always sync to a WWV HF signal or a comm center chronometer every few days. When you’re out in some Godforsaken wilderness, desert wasteland or jungle, watch battery replacement isn’t feasible. The 6-band time sync is a bonus. If outside a region covered by one of the LF time signals (e.g. WWVB), it will continue working just fine, with the ability to set the time manually as needed, which shouldn’t be very often. The moderate size makes it much easier to keep under a sleeve when necessary and much less likely to get snagged and caught on equipment, the consequences of which could be injurious. A thinner profile so that it doesn’t stand as proud on the wrist would be welcome without compromising its near indestructibility. Small size and small thickness were part of the MIL specs. I have a Casio G – Shock DW6600 but the pushbutton for the light is gone. Is there somebody who cab send me the pushbutton please? This watch is a emotional watch. I get it as a gift from my son when he was a militair. I served in the military for 20 years and through them I was issued several G-Shocks which facilitated my job; these watches can take the daily beatings of military life, needless to say the tough and crazy rigors of actual combat training which we constantly find ourselves in. 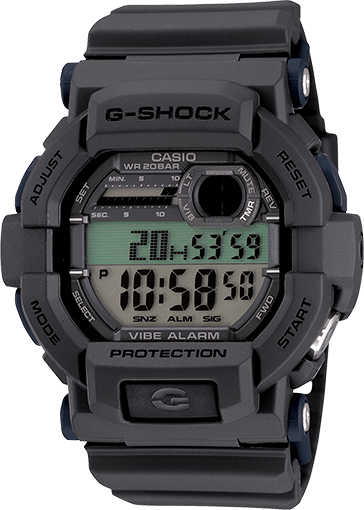 I would have to say the most popular G-Shock model to be issued during my time in the service has to be the DW6900-1V. Its a rugged compact watch which had everything we needed at the time. However, with the advances of military technology and the changing facets of modern warfare more units are begging to issue out the iconic GW9400-1 Rangeman. Great watches which are dependable and extremely utilitarian in nature; a perfect fit for military life.